We are delighted to present our Console Fer, recently chosen by Gabby Deeming for the Notebook pages in House and Garden. 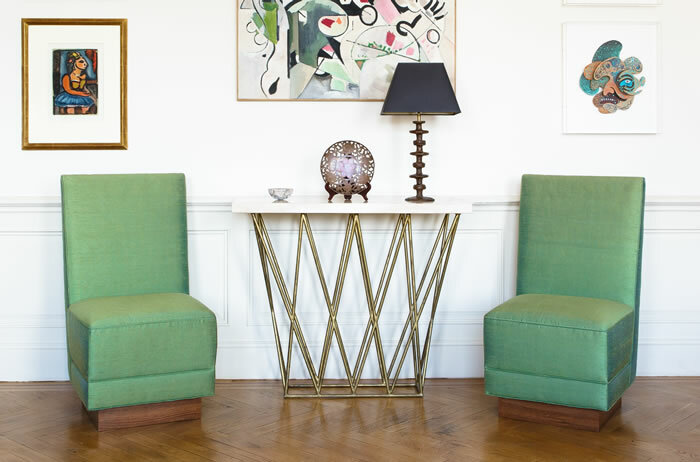 The original mid-century model was first spotted in Paris and is now made by skilled artisans in Provence. As shown above with a patinated iron base and Pierre d’Egypte stone top, this console can also be customized with a bronze base and a choice of material for the top. The narrow width makes it perfect for entrance halls and alcoves; bespoke length is possible to fit individual space. On either side of the Console are our elegant 1940’s inspired Chauffeuses. Originally designed to be a focal point by the fireside the Chauffeuse had a low seat which kept the occupant close to the fire whilst the high back provided shelter from drafts. Our modern day version makes an interesting occasional chair. Shown here the Chauffeuse has a veneered oak base and is upholstered in a raw silk from Colony Fabrics. It can be upholstered in any fabric and the base can be made in any wood or finish, including mirror. Please visit victoria@stainow.com for more information and contact us on +44 (0)7956 113779 if you would like to view any or all of the collection first hand.